In October 1940, a fresh-faced young American named John Buccellato, just out of his teens, enlisted in the United States Army Infantry. His parents who were middle-class Sicillian immigrants lived in an apartment block facing Central Park in New York City. His mother was a milliner. Within two years ‘Butch’ Buccellato found himself in Italy and North Africa alongside his colleagues fighting against the Nazis. In 1944 he arrived in England on board the Queen Mary which had been requisitioned as a troop ship. On the voyage from America, the men slept in shifts ‘hot bedding’ the limited number of bunks available on the ship. By the early Summer of 1944, ‘Butch’ and a large number of military personnel of many nationalities were in Leamington awaiting orders for their departure for Operation Overlord, the allied invasion of Europe. The GI’s found the spa town very much to their liking and they enjoyed their strolls in the Jephson Gardens where on one occasion they found their Australian infantry counterparts honing their marksmanship skills by shooting the ducks on the ornamental pond. The Aussies plucked and dressed the ducks and roasted them over fires fuelled by smashed up wooden park benches that they had ‘liberated’. It has to be said that the American GI’s were very popular with local girls. At a dance in the Palais de Danse in Spencer Street, ‘Butch’ met a good looking girl named Elsie Stanley who lodged with her sister Kit in rooms at 31 Willes Road (Lansdowne Crescent). In due course ‘Butch’ packed his kitbag for the uncertainties of Omaha beach leaving behind Royal Leamington Spa and Elsie, who was soon to realise that she was pregnant. On March 18th 1945 Elsie was delivered of a daughter christened Pamela Ann.The story now fast-forwards sixty five years. On a particularly cold March morning, I was cleaning in the Parish Church, broom in hand, when I was approached by a lady who introduced herself as Mrs Pamela Birch who was with her husband Terry. They were quite obviously on a quest. Their enquiry centred around any baptismal record we might have for Pamela. She had been born at 31 Willes Road in 1945 and had brought with her her Birth Certificate which bore the name of her mother Elsie Stanley. The space for the name of the father was blank and had a line drawn through it. the personal computer my daughter Sally- Anne acquired, and her access to the internet, that ultimately helped us to unravel the story in 1998.The service records of former U S Army personnel have been available online for some time under the USA Freedom of Information legislation. It didn’t take long to access the records and to establish that not only did ‘Butch’ survive Omaha beach but he was also alive and well and living on the Hudson river north of New York. Within a matter of hours Pamela had spoken to her father on the phone. The following year, daughter and father met for the first time when ‘Butch’ came over to England. 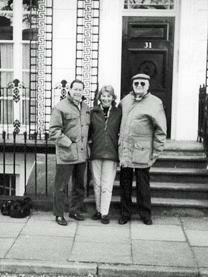 They came to Leamington where the former GI posed on the steps of the house in Willes Road where Pamela had been born and together they walked in the Jephson Gardens and admired the ducks! John Buccellato told Pamela how he went ashore on Omaha beach with the second wave assault by the US First Army Division. 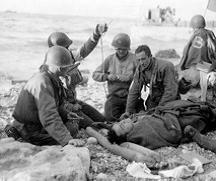 Many of the young ‘rookies’ in the first wave attack had been shot to pieces by machine gun fire. Surprisingly one of his most vivid and lasting memories was not the mutilated corpses of his colleagues but the scores of dead fish they had to wade through to reach the beach. After breaking out from the beaches he and his company reached the village of Saint Lo. It was at this stage that he was stricken with a severe bout of uncontrollable shaking which had nothing to do with the situation he found himself in but something that Butch immediately recognised as a symptom of malaria which he had contracted while serving in North Africa. It was very clear that John’s part in the invasion of Normandy had been brought to a somewhat premature conclusion. His commander arranged for him to be taken to the Louis Pasteur hospital in Cherbourg where he spent the next month before being shipped back to the Army Hospital for Pacific & European Tropical Diseases in Swannanoa North Carolina where he spent the next twelve months recuperating. Pamela tells me that Butch is still going strong at the grand old age of ninety. He has never forgotten his brief wartime stay in Royal Leamington Spa on the long and eventful journey from Central Park, New York to Omaha Beach in 1944.